This recipe may seem like a lot of work if you have to go through the trouble of smoking an entire salmon in order to just make a dip out of it. However, since this recipe only requires a small amount of salmon to mix into the dip, we recommend smoking a large salmon filet and then cutting off some to make the dip. Smoked salmon will save well in the refrigerator, so you can even cut some off and make this dip the next day. If you are looking to find out more about how to smoke your salmon for this dip, visit our cedar plank smoked salmon recipe. This recipe is great for making this dip with the natural aroma the cedar plank provides during the smoking process. First, you will need to have already smoked your salmon. Combine half of your smoked salmon with the cream cheese, sour cream, lemon juice, chopped parsley, horseradish, salt, and pepper in a food processor. If you don't have a food processor, we recommend using a hand mixer or some other mixing device in order to make the dip have a smooth texture. Turn on your food processor and blend all the ingredients until it has a smooth and almost creamy texture. Next, take the dip mixture out of the food processor into a serving bowl. Sprinkle the other half of your smoked salmon on top of the dip and mix it in with a spoon or spatula. Since the other half of the salmon was blended with the food processor, this additional salmon will add larger pieces into your dip. 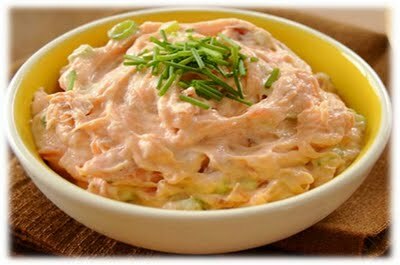 The larger pieces of salmon in the dip will boost the salmon flavor and make your dip more visually appealing. Serve your smoked salmon dip recipe along with either bagel chips or wheat thin crackers.